Yee Ha! Are you ready for our western stickers? 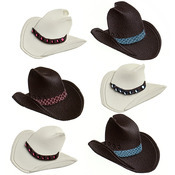 Choose from cowboys, cowgirls, boots and horses. Make any scrapbook album or craft more western by using these stickers!